ONE. showering, doing my makeup nice and putting on some nice but comfortable clothes (anything above a "under no circumstances" on the "should I wear this in public?" scale). TWO. cooking myself something nice and nourishing and comforting. My current favs include a halloumi salad wrap, an FLT (veggie bacon tastes better in a sandwich with mayo: fact) and a toasted cashew salad. THREE. #talkingaboutit on Twitter. Sometimes when I'm feeling down, being able to communicate via a tweet rather than having to physically find words and somehow speak them? It's the difference between a good day and a bad day. That hashtag is such a great place to be, too. FOUR. listening to music. I have great Spotify playlists for moping to but I also have the perfect playlists for helping to pick my mood up, too. Sometimes all it takes is Drake and I'm not sorry 'bout it. FIVE. a spring clean. Tidy flat, tidy- yeah you get it. Seriously, though, since moving into my new apartment I've noticed even more how huge an impact a clean, tidy and organised space has on my mind. 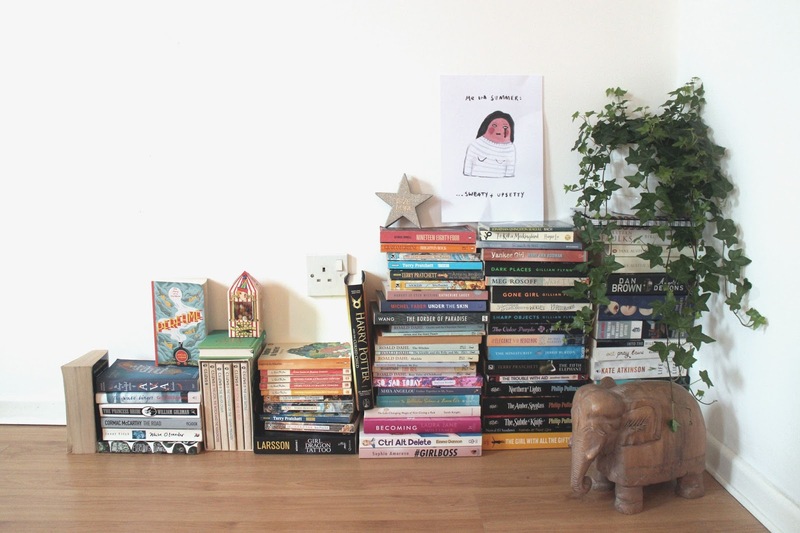 Also, it's fun to take pride in your home and yes I did arrange my bookcase by colour. SIX. creating something; baking cinnamon raisin cookies, working on a drawing, experimenting with a new makeup look, writing something I'll probably never publish. NINE. Friends. The TV show, I mean. Obvious, maybe ("that is brand new information!") but don't underestimate the cheer-up power of the Friends gang on a down day. I've been re-watching every single episode from the start and my sad little brain thanks for me for it on a daily basis. Hey, UK Netflix, when are you getting Friends? TEN. Achieve something on my necessary to do list: answer one email, make one phone call, make one decision, pay one bill. Whatever it takes to be able to say I've achieved something, anything, with my day. R&R is good for the mind, body and soul, but productivity and that feeling of accomplishment is a great way to get out of a slump. What do you do to cheer yourself up on a bad day?